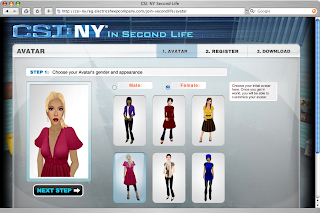 Yesterday we were finally able to get our hands on the new OnRez viewer for Second Life that was made for a special episode of the hit show CSI New York (which was also aired last night). 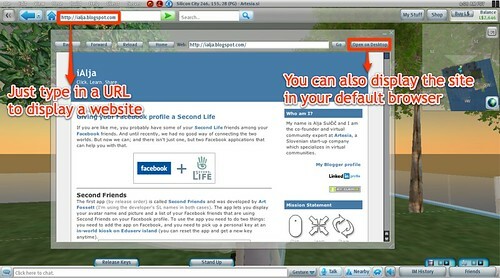 The viewer is available both for Windows and Mac OS X and it’s got a simplified user interface and a built-it browser. If you’re familiar with the existing Linden Lab’s viewer you’ll need some time to get adjusted to some changes. The most obvious one is the fact that you now have the Friends button in the lower right corner instead of the Inventory button - I suppose they think users will need their friends’ list more often then their inventory, which can now be found under a button at the top of the screen and it’s been renamed to “My Stuff” (I don’t even want to comment on that). The good news is that most of the shortcuts still work, and you still have the client menu and all the advanced options (you need to manually enable the Build menu and the advanced options under the View menu). And even better news is that we now finally have the back button (and teleport history) built-in. The home button in the upper menu bar is a bit confusing for me though - it takes me to Central park on the CIS sims, although the usual shortcut for home still takes me to my real home. But the best feature of all (at least for me) is the built-in browser. Sure, it’s pretty basic (no Flash for example), but it works, it’s fast, easily accessible and it seems like a better way for displaying text help files than through notecards, as web pages can of course be hyperlinked and enriched with various design elements. Overall I think I prefer the OnRez viewer to the Linden Lab’s one. Yesterday I had some problems with textures not rezzing, but now everything appears to be ok (they already had their first update yesterday). You do get CSI pop-ups each time you run the viewer and login, but they can easily be closed. I think I’ll stick with this viewer for now - mostly because of the browser. 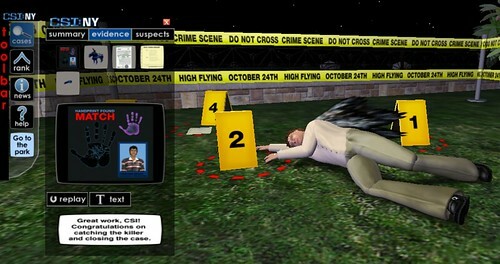 Anyway, I was also curious to see the CSI TV episode to see how they presented Second Life. I got the chance to see it this morning, and… hm… let me just say I’ve laughed out loud a few times. I don’t know which world they filmed this episode in, but it only looked like Second Life if you took screenshots of the scenes. There was absolutely no lag (! ), everything (especially dressing up) was done through a keyboard, no pie menus etc. Not to mention the silly gladiator game effects (there was a large audience at the event - certainly over 40 avatars - and no lag or crashing! 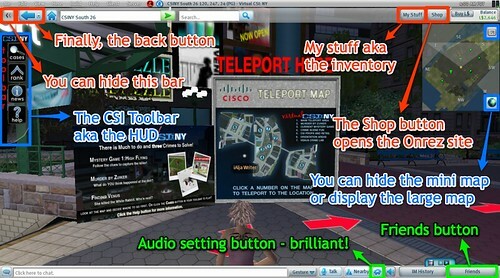 ), everybody using tools to fly, the silly comments made by most of the CSI team, and some sort of Second Life virus? Somebody’s been reading Snow Crash I presume or just playing another video game. Oh well, we’ve all seen how hacking is usually presented in movies. But anyhow, I’m not quite sure the picture of Second Life on the show would manage to get me interested enough in SL if I were a CSI viewer that’s never heard of Second Life. I mean, why would I want to go into a virtual world in which there’s a tech savvy professional killer or a world in which you can get a strange virus that keeps a whole team of IT experts busy for hours to fix? I certainly hope the commercials were better than that. Anyhow, quite many viewer of the show were apparently intrigued by the whole thing, and at this moment we still have many CSI newbies wandering around (btw we’ve also got improved versions of Clint & Brandy - they come with skin, prim hair and decent clothing now ;) ). A few moments ago I re-visited some of the orientation spots and I saw a lot of confused users. Not many very talking. Maybe they just didn’t realize they can use text chat - in the CSI episode they were using voice chat all the time; yeah I know, how realistic! Actually, just one newbie said hello and asked me “what are we suppose to do or where are we suppose to go?”. Hm, maybe not such a good orientation after all. Maybe we should have more greeters at the starting points (I did meet one last night). 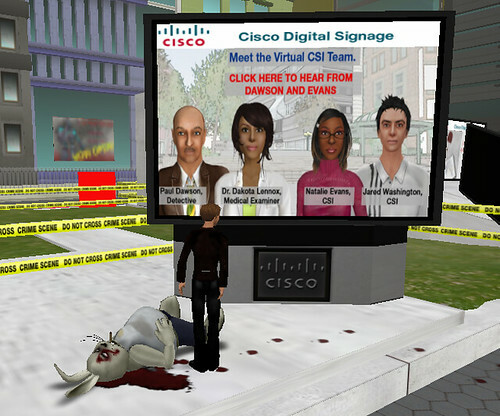 I think it’s still way too soon to make any final judgments on the successfulness of the whole CSI in SL thing. I’m personally glad I got a nice new viewer, but we still have to see if and how the CSI viewers will play along in this game. The Second Life grid survived last night (the load wasn’t even that big), but let’s wait for a few days to get more numbers and to see how many of the new users will stay in SL after they learn how the world really works.